Usually, mapmakers don’t invent whole towns out of paper and ink. Usually, they craft more subtle traps: nonexistent dead ends or fake river bends or adjusted mountain elevations. Mapmakers rarely officially admit to “trap streets,” but it’s an age-old practice to keep copycats at bay. If a competitor just so happens to have the same fake town on their map, then you’ve pretty much caught them red-handed. That’s what Otto G. Lindberg of General Drafting Co. thought when he saw Agloe on competitor Rand McNally’s map. Agloe was the invention of Lindberg and his assistant, Ernest Alpers; its very name was a mix of their initials (OGL and EA). Agloe did not exist, Lindberg asserted with confidence. The owners had seen Agloe on a map distributed by Esso, which owned scores of petrol stations. Esso had bought that map from Lindberg and Alpers. If Esso says this place is called Agloe, the store folks figured, well, that’s what we’ll call ourselves. So, a made-up name for a made-up place inadvertently created a real place that, for a time, really existed. Rand McNally, one presumes, was found not guilty. So there you have it, a fake town that became real. Agloe’s fate may be among the strangest, but it is the only copyright trap that took on a life of its own. Take Argleton, for example, a town in northeastern England—or, more accurately, an empty field in northeastern England. Yet, for a while, Argleton existed on Google Maps, and websites listed hotels, businesses, and apartments for rent in the town. The businesses were real, but they just existed in other nearby towns. In 2009, Google erased Argleton from its digital map. 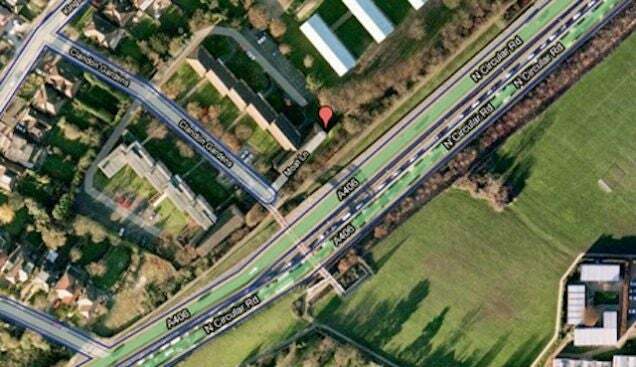 Moat Lane is supposed to be a curving road in Finchley, North London, though Google’s satellite view reveals only trees and gardens. Like Argleton, Moat Lane was likely carried over from the TeleAtlas directory, which formed the early basis for Google Maps in Europe. Like Argleton, it has since been erased. The A-Z map of Bristol contains a little dead-end street called Lye Close, jutting out of Canynge Square. It’s not indexed in the map’s list of streets and it’s oddly placed, though you might say it is aptly named. Good job, mapmaker. Because the practice of trap streets is unofficial, sometimes it’s not so clear if a nonexistent street was deliberate or just an error. Kemp Ave in Toronto, for instance, is an unmarked and unpaved lane behind some houses. It’s been erased from Bing Maps, but it still appears in Google. Whither the trap street in the age of Google? Perhaps you’ve noticed that the fates of many of these copyright traps have ended with being erased by Google or Bing or some other keeper of the digital map space. With multiple maps of every square mile of the world at our fingertips, trap streets are no longer the secret they once were. Google, Bing, and HERE all gave me roughly the same response about how seriously they take such errors. And it’s true, many chronicled trap streets and towns have quickly disappeared from the digital record when someone pointed them out. These fake streets were always kind of a paradox, inherently contradicting a map’s purpose of accurately reflecting reality. A class of Easter Eggs can be implemented by digital map providers who do not want their raw map data (vectors) copied. The lower bits of the geographic coordinates are mangled in some systematic way so that it would not be obvious to a user of the map, but could be used in a Copyright trial to show that the data had been copied. There are more subtle things, too. OpenStreetMap is in the business of letting anyone copy their maps (with credit), and so when Apple Maps took OSM data, the community immediately noticed. They noticed, for example, that Apple Maps had the exact same streets and buildings labelled in Pakistan. They noticed winding trails oddly mischaracterised as roads. A similar area of Norwich in Apple Maps (left) and OpenStreetMap (right). The shape of the trails are the same, but they are miscategorised as roads in Apple Maps. As noticed by Alastair Aitchison. Trap streets are easier to spot nowadays, but that doesn’t mean maps are easier to copy sneakily.